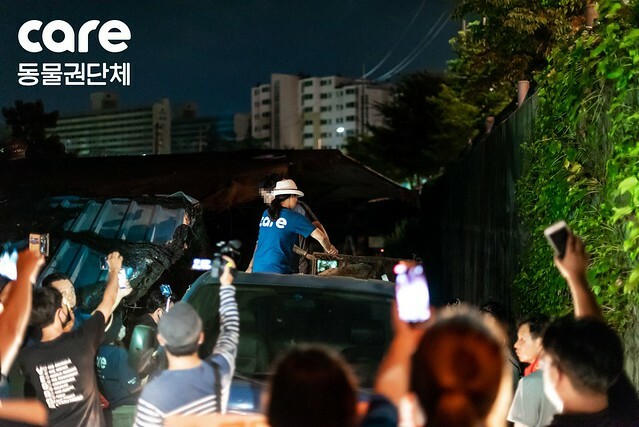 Demonstration at Taepyeong Dog Slaughterhouse on July 25, 2018. Click HERE to sign and share CARE’s petition. 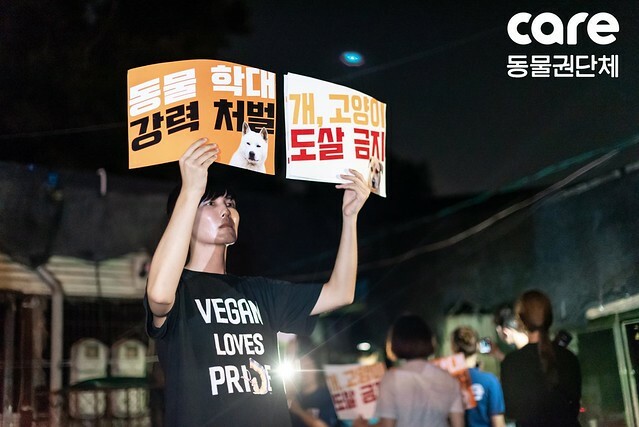 CARE and over 20 individual animal rights activists took part in an unplanned protest at Taepyeong Dog Slaughterhouse, where an unimaginable number of dogs are slaughtered every day. 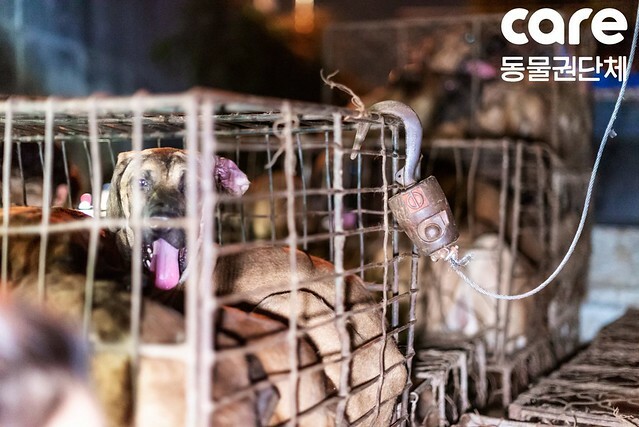 This place, where large-scale slaughtering takes place more than deserves its nickname “Dog Killing Factory.” Too many dogs are crammed into too small steel cages waiting to be brutally murdered. 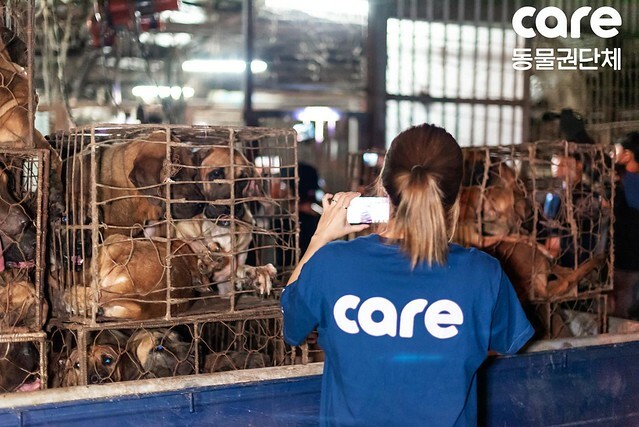 CARE stated the recent ruling in a Bucheon court that slaughtering dogs for consumption violates the Animal Protection Act. 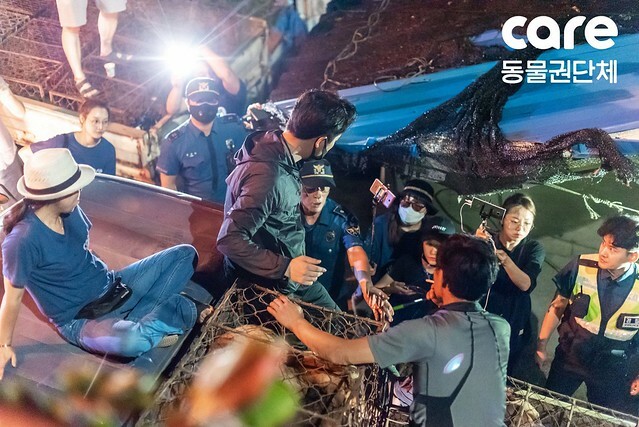 However, the police officers dispatched from Seongnam City Police insisted they were not aware of such ruling and refused to take action at the scene. 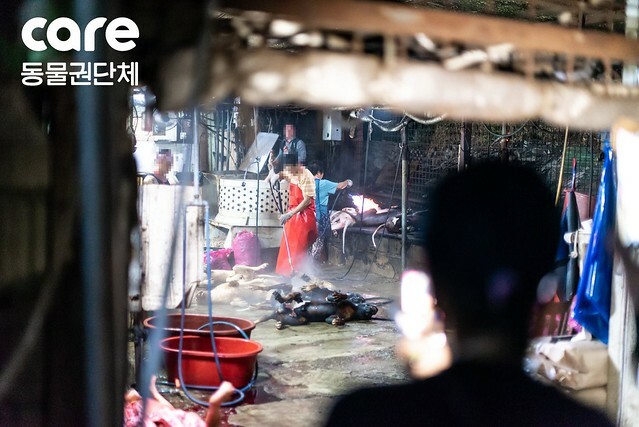 Activists came and went while the police simply watched dogs being slaughtered and sold in Seongnam market. 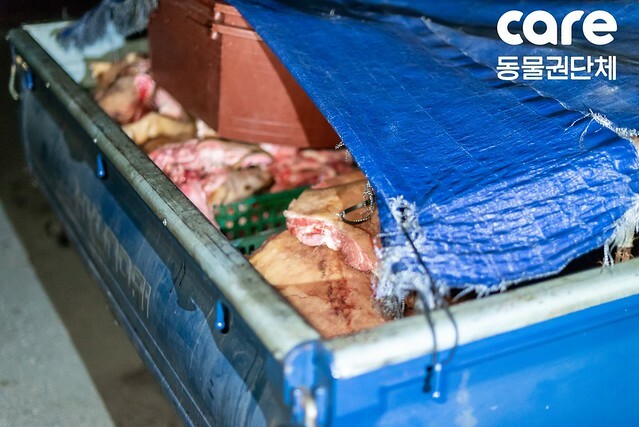 Seongnam City had ordered Taepyeong Dog Slaughterhouse to shut down by the end of August, but recently extended the time frame without reason, and appear to be granting the slaughterhouse workers their living for yet another summer. Click HERE to see the CARE’s post on Facebook. 동물권단체 케어와 20명이 넘는 개인활동가들은 개가 가장 많이 도살되는 중복에 태평동 도살장 기습 시위를 했습니다. 많은 수의 도살자들이 모여 개들을 죽이고 사체를 해체하는 대규모 작업들이 이루어지는 그곳은 ‘개도살 공장’이란 표현이 무색할만한 곳이었습니다. 또한 여전히 수 많은 개들이 좁은 철장 속에 구겨져 유통되고 있으며, 도살을 기다리고 있었습니다. 케어는 식용목적으로 개를 도살하는 것이 동물보호법에 저촉된다는 판결을 받은 바 있습니다. 하지만 출동한 성남 시 경찰은 이를 모르쇠로 일관하며 현장에서 아무런 행동을 취하지 않았습니다. 밤새, 수많은 활동가가 오가고, 경찰들이 그 자리를 지켰지만 아무렇지 않게 개들은 도살되고 모란시장으로 팔려나갔습니다. 최근 성남 시는 태평동 도살장의 폐허 시기를 8월 말로 잡고 있었지만 무슨 이유에서인지 연기가 됐습니다. 한 여름 그들에게 한 몫이라도 더 챙길 시간적 여유를 주려는 것일까요? 동물권단체 케어는 개도살이 멈출 때까지 끝까지 싸우겠습니다. Stoped to kill and eat dogs and cats!!!!! PLEASE HELP END THE AWFUL LIVES THESE SUFFERING ANIMALS HAVE!! !